Taylor Baker, 27, is a very unique Eurolanche member. He is probably the only member who works directly at the Pepsi Center. Taylor is an assistant manager at the official team store, Altitude Authentics, which is located in the Grand Atrium at the main entrance to the arena. Taylor’s work place is a dream for many Colorado Avalanche fans. He is surrounded by thousands of souvenirs, clothes and memorabilia with an Avs logo. His main duty is to take care of the shop in general – from checking the availability of specific souvenirs and making orders at the warehouse, to taking care of the customers. “Hockey is a big part of my life. Most people would say I am from Canada because of how passionate I am,” said Taylor, who has become a Eurolanche member two years ago. 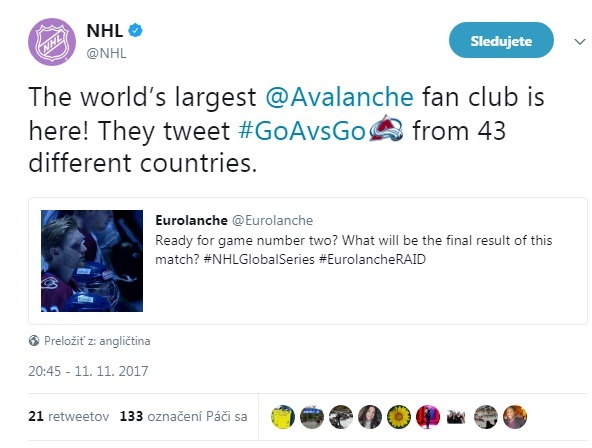 Taylor is one of the local US Avalanche fans, who meet with Eurolanche members participating in the in the annual Eurolanche Invasion project. He often witnesses their crazy shopping sprees at the official team store, where they spend thousands of dollars. There probably isn’t any another group of fans, who spend as much money at once and fill dozens of bags with new souvenirs and clothes with the same logo. Taylor and his colleagues fully understand them, because for many European fans, it is the first and last chance to shop directly in the team’s official store. Those of them who come back regularly are already well known to Taylor, who always chats with them during their two-plus hours of shopping. “The dedication of these guys is incredible. I can see it every year, when they come to the store. They pick jerseys, t-shirts, pucks, hats, anything! I have never seen such passionate fans before,” said Taylor.